Home » More... » What Are Crop Circles? 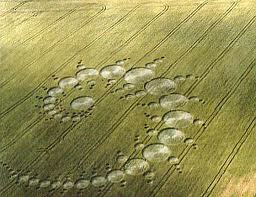 Crop Circles are called this since the circular impressions are usually made or found in crops in rural areas. Strangely enough they are often located on the outskirts of towns and cities, near to main roads or highways. Many of them have occurred in England and for some reason there was more of a sighting of them in the 1970s’s and 1980’s. However according to global news source Huffington Post, crop circles have been occurring since the late 1800’s. For many years scientists, members of the public and amateur UFO-sleuths have been fascinated with these indentations. Usually they are made at night, appearing suddenly the next day as if the grass is impacted by some large circular object. Although there were odd sightings in the 1960’s, the first modern day crop circle was observed in 1972 by two English men, Arthur Shuttlewood and Bryce Bond. Strangely enough they were seated on Star Hill near Warminster. They were not just gazing at the night skies, they were doing what many people were doing back then, trying to spot UFO’s otherwise known as Unidentified Flying Objects, made famous years later in the Close Encounters of the Third Kind movie! As they watched the skies, they suddenly saw an impression made in the grass just in front of them. It appeared that the grass was opening up, causing a circle to be formed. Since this time there have allegedly been over 10,000 reported and documented crop circle sightings. They have been in the UK, in Canada, Russia, USA, Japan and even Tasmania in Australia. 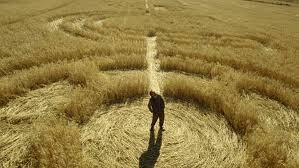 Throughout the 1970s through to the 1990’s crop circles were thought by many in Southern England (where the largest majority were cited) to be genuine. No one knew the cause and possible explanations varied from sudden winds (changes of wind patterns), animals, people playing elaborate pranks to the extreme of UFO’s visiting their native shores. As early as 1991, two UK pranksters admitted to creating the majority of crop circles. They demonstrated to reporters how they created the effect, essentially using a plank of wood, rope and a baseball cap (this kept them in a straight line). They went on to claim that they were remarkably the culprits for making all crop circles prior to 1987. That may well have been the case but what about the crop circles cited since and not just in the UK. 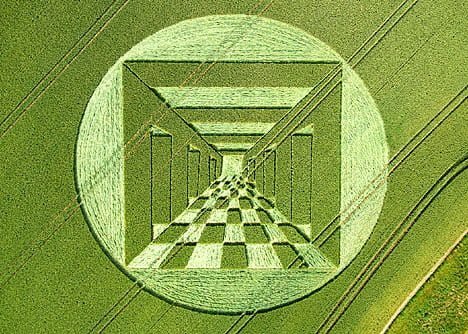 Surely the size of these crop circles and their sudden appearance could not be attributed to one or two people traipsing all over their countries to trick their fellow citizens. If so what a weird hobby and idea of fun! Other sources of crop circles were found to be made by animals doing their thing. In Tasmania in Australia the wallabies (related to the kangaroo species) had been trampling on medicinal poppies in a field there. Somehow their movements created a perfect circle! Another slightly less obvious cause of the crop circles has been linked to briefly occurring isotopes in soil in the crop circle areas. At the same time locals have reported local failed car batteries, power outages (all recorded and documented). Meanwhile the crop circles themselves have produced radioactive readings 300% of the normal level, related to the occurrence of soil isotopes mentioned above. It was observed too that animals appeared agitated and avoided the crop circle area even before it appeared. In other instances it is thought to be sudden weather changes, specifically sudden winds that flatten the grass or crops but why a circle? This was initially thought to be the cause of the Southern England (extensive) circle crop sightings. The winds were supposedly then affected by the unique hills of Southern England. Then when the shapes became even more complex, additional theories such as wind vortexes had to be considered. Now in 2014 it appears that while many of the crop circles in the UK at least may well have been hoaxes, not all the 10,000 crop circles can be attributed to pranksters! Some just might have been left by a visitor from outer space or by highly sophisticated government flying space craft of which we everyday citizens have no comprehension of at this point in time. Shown below – a crop circle shape on the outskirts of Mexico.